One bubby and zaidy (code: grandparent) available to adopt. May apply individually or as couple and preferably are named Ida, Charlie, Leo, or some combination of the three. Must have: ample spare time for doting, firm belief that I am the most amazing human to walk the earth (or at least give me that impression), gushy, squishy elbow skin to play with, ability to tolerate me playing with your elbows, soft hands, kind eyes, willing to tell stories about your life - bonus points if they include creative uses of saran wrap, patience in the face of my young mistakes (read: stupidity), and unconditional love. Payment for these services include: frequent calls to update on my life, say hi, wish you a happy thursday; partner for crossword puzzles and clipping sunday coupons; optional chauffeur - as long as it doesn't involve parallel parking; someone who believed you are much more wise, valuable, and priceless not despite your age but because of it; verbal adoration and unconditional love. To apply: send newspaper clippings about things you would like to warn me about, home-made cookies, completed crossword puzzles or hand-knitted anything. This is not an exclusive position - will accept multiple applicants. And I did absolutely nothing to earn this blessing - born into the right family, i got lucky. And even luckier that I had one set that lived close by for half of the year (no snide comments about snow birds from anyone please!) so doubly lucky. There were friday night sleepovers, an education in card games, afikomen money from the top giver at passover, letters at camp, and adoration galore. And when visiting the other set in Toronto, you walked into a picture shrine to the grandchildren (keep in mind that there were only 2 - my brother and me), with a seventeen course dinner of the most delicious brown foods that you're better off not knowing their origin, and love that was so strong that they had to be warned..."don't squash them leo!" So, lucky - I know. To be fair, i have to say that i still have one grandparent left - bubby rene is the sole survivor. 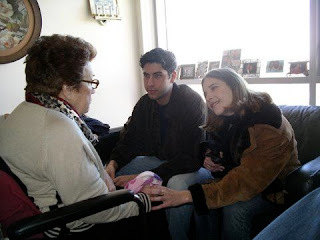 She is a survivor in more ways than one - Holocaust survivor, survivor of crushing loss and pain, survivor of being an immigrant, survivor of her husband who passed away 6 years ago. And yet, the bubby rene I love so much isn't there. I often have to remind myself that she is - living in a nursing home in Toronto. But alzheimers has stolen her mind, and so she doesn't know who I am, who she is, or where the sink is. She doesn't scold us "Don't touch the hair!" when we tease that her updo adds four inches to her 5 foot frame, cook five cakes just in case we might be hungry when we visit after dinner, travel with suitcases full of socks and cotton pjs and frozen corned beef when she comes to visit, or gaze at me the entire visit as if I could do no wrong. Who knows - maybe she knows more than I think. This is what I know - she doesn't speak, doesn't light up anymore if I visit, doesn't hug me when I say goodbye. So I mourn her like I do Bubby Ida and Zaidy Charlie and Zaidy Leo. My biggest fans have all disappeared and it was a rude awakening to discover that it's hard to find people who think I walk on water. And so I collect grandparents like others collect stamps (do people even collect stamps anymore? what do people collect now? cell phones?) I seek them out - finding them at shabbat dinners, on airplanes, on the side of the road. I have a soft spot for older ones and a radar that flashes so I know that the old man in front of me at the grocery store is an applicant. I miss my grandparents on the obvious days - holidays, birthdays, tuesday nights, thursday afternoons, you know - typical. And then there are those moments where i am overwhelmed by their memory and the missing them grows...that old man cologne that screams Zaidy Leo, the handwriting on the envelope from my aunt that makes me swear Bubby Ida wrote it, the sight of a woman peering of a balcony waiting for her loved ones to be sighted as Bubby Rene would wait every time we visited, peeling apples for the charoset on passover just like Zaidy Charlie... Tonight, it was simply the chill that makes me reach for the pink blanket Bubby Ida knit for me, wishing all the while I could trade the blanket for a hug with her. i want to cry when i read this. it touches me on so many levels. Everything you write, touches me. Whether it is here on this blog-or in the Jewish Magazine. I love your creativity, your passion, and your beautiful pallette of words. I have become a grammy. It is something, to have a grandchild. A little precious, i am so sure most precious girl in the world. And grammy hood has changed me...it allows me a second chance at a childhood or kind of mother hood that i really never got to have. Anyway, i think of you often. I am so glad i get to keep up with you through your writing. I love it--and i think you are very very very special!